VATICAN CITY (CNS) – Sometimes a job is just a job, even when from the outside it looks like it involves the stuff of an Indiana Jones movie. Fabrizio Bisconti is the newly named archaeological superintendent of the Pontifical Commission for Sacred Archaeology, which oversees the upkeep and preservation of 140 Christian catacombs from the third and fourth centuries scattered all over Italy. Most of the time, he said, the job is just work and study. Staff members can spend a full month with surgical tools and cotton balls cleaning a third-century sarcophagus, but then there are those stunning, shocking, awe-inspiring moments of discovery. Mid-June brought one of those “wow” moments when restorers cleaning a ceiling in the Catacombs of St. Thecla found what turned out to be the oldest known image of the apostle Paul. The fresco was hidden under a limestone crust. “Certainly, there is great emotion when you find something new, but for us archaeology is our job, the subject of our studies,” he said. Bisconti said most of what he and his fellow archaeologists do all day involves very slow, painstaking precision care of the oldest intact Christian monuments and artwork. Very little remains of any Christian church built before the fifth century, but the 140 catacombs in Italy offer clear evidence of how early Christians worshipped, how they lived and, especially, what they hoped and believed about death. Because the catacombs are underground and were filled in with dirt in the fifth century – when people began burying their dead in cemeteries within the city walls – the catacombs remained remarkably intact, Bisconti said. Deciding which catacombs to excavate and whether or not to open them to the public is a process that takes years and tries to balance the values of preservation, scholarship, education and Christian devotion, he said. “Opening a catacomb means allowing its degradation,” he said. As soon as the dirt in a catacomb is removed, the frescoes and inscriptions start fading and decaying. Human visitors, who sweat and breathe, add moisture to the air, which speeds up the growth of mold and the flaking of any painted surface, he said. The catacombs are technically the property of the Italian government, which under the terms of the 1929 Lateran Pacts with the Vatican, entrusted their care and oversight to the Vatican. Most of the 140 Christian catacombs in Italy are in Rome, and only five of those are open to the public: the catacombs of St. Sebastian, St. Callixtus, Priscilla, St. Agnes and Domitilla. “There are many, many other catacombs,” he said. 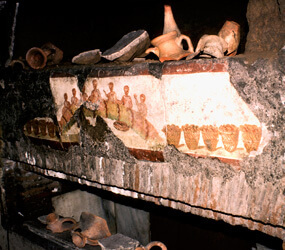 For Bisconti, the most interesting of the closed catacombs is one on Via Latina in Rome. “It was discovered in 1955 and we have found more than 100 frescoes of scenes of the Old and New Testaments, but also of pagan myths,” he said. The most popular Old Testament stories are Abraham’s sacrifice of Isaac, Jonah in the belly of the whale, the story from the Book of Daniel about Shadrach, Meshach and Abednego in the fiery furnace – “all of these gave support and comfort to Christians because they are examples of salvation,” Bisconti said. Most of the catacombs were built around the tomb of a martyr because other Christians wanted to be buried near a hero of the faith. Even after the catacombs were no longer used for burial and were filled in, paths leading pilgrims to the martyr’s tomb were left open for several hundred years. Most of the catacombs demonstrate the early Christian preoccupation with the equality of all believers, he said. The bodies were sealed into niches carved out of the earth, usually with very simple inscriptions. Slowly, however, decorations were added and wealthier Christians were buried in sarcophagi or thick marble caskets. Bisconti said his office is two or three years away from allowing the public to visit the Catacombs of Pretestato, located near the Catacombs of Domitilla. Never before opened to the public, the Pretestato burial grounds are the site of more than 1,000 sarcophagi, many still intact. “It was very snobbish, very chic” to be buried there, Bisconti said. The superintendent added that, whether dealing with a sarcophagus or with a simple niche in a catacomb, if a sealed tomb is found, Vatican workers leave it closed out of respect for the deceased.